Thank you very much for your interest and for visiting our website. We urge you to review other topics at this site to get a complete view of our company, its product, and the considerable opportunities that await us. The portable infusion market has been showing substantial growth and potential for an extended period. However, it is crowded with expensive, bulky devices powered by motor, or drive systems which are inefficient and still costly. > Existing Infusion Pumps require large volumes of fluid to be accurate yet the drugs they intend to use are packaged in highly concentrated forms in small volumes. > Syringe Pumps also have issues while medicated patches are adequate but unable to deliver all drugs and can’t adjust to patient responses. > IV Drug delivery is complex with multiple steps and hand-offs that lead to medication errors. > PCA’s (Patient-Controlled Analgesia) units require significant monitoring by medical staff, have had an unfortunate error history and a very high operating cost. Mark Banister, who would become Medipac’s Founder and Chief Technical Officer, invented a polymer which exhibited unprecedented expansion and high force. He envisioned that this would be relevant in multiple markets, including drug delivery. Ultimately, with the use of very low energy (a coin cell battery) this material could expand up to 4 times its size, generate a very high force while displacing a considerable volume of drug. In other words the polymer itself had become the device’s supremely efficient motor. From this discovery we developed our current solid state Mini-Infuser™, or revolutionary lightweight, wearable, disposable micro-pump technology platform with a broad range of programmable capabilities. 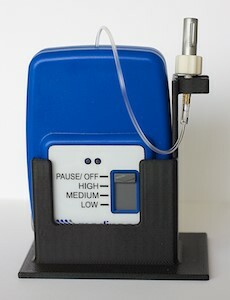 We are developing an option for wireless transmission which can precisely monitor dosage levels being applied remotely. In sum it’s a highly accurate low cost device with no mechanical parts, and because of this efficient design, patients are able to take advantage of its sleek thin form and wear the device comfortably under clothing. in therapeutic care, making it ideal for the Pharmaceutical, Biotech, Hospital, Hospice, and Veterinary markets.